Salem and Tortuga 1667 have both been huge successes. What is it you think the Kickstarter audience loves about your games? Travis: I think they really like how the games look. Obviously 99% haven't played the game before, so they are basing a lot of it on what they see. I also think people really like the packaging, how it comes in the book. I think both games have been able to transport people into the worlds we created. Our illustrator Sarah does a really great job with the illustrations and my wife puts together the graphic design. There are a lot of textures and pieces of that world that draw people in and help them immerse themselves into the game. I also think there is room for our games in the market. Salem went from 4-12 and Tortuga is from 2-9. There aren't many high player count games out there. Usually games top out around 7 players with games like 7 Wonders. There are some exceptions with games like The Resistance that go from 5-10, but those are certainly the exception and not the rule. Travis: Yeah, exactly. I think there is room for some good social deduction games with good structure, and I think we hit that sweet spot for people. Beyond that your guess is as good as mine. I think you are on to some really good points. The art for both games is fantastic, Tortuga especially. 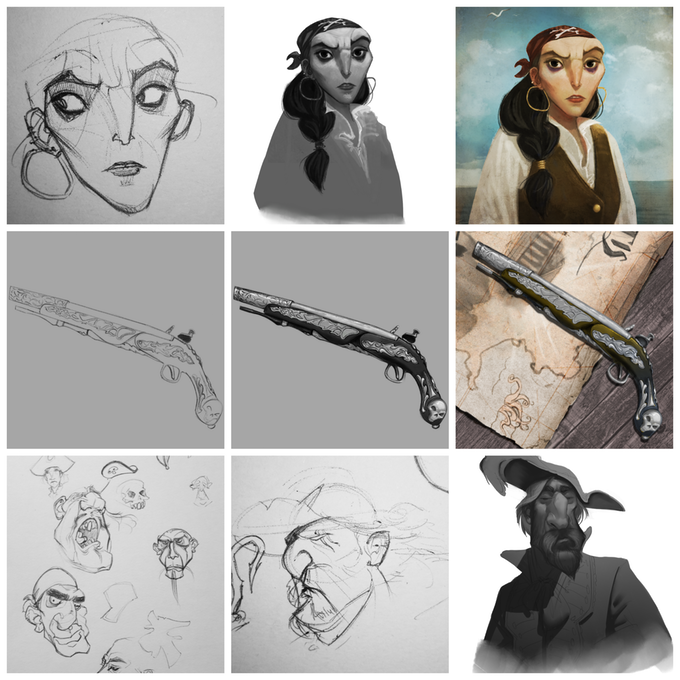 I was looking through the Kickstarter where you show how your team went from the original sketches to adding in more texture and then the final drawings, the entire process is fantastic. Was Sarah Keele the illustrator for both games? Travis: Yes, she did both games. So, you've mentioned in previous interviews that Tortuga is part of a series of games. Can you give us any hints as to what might be the next time frame in the series? Are we going to keep looking to the past, or can we expect a a game that looks to the future? Travis: Yeah a lot of people have tried to pry that out of me so far. We're keeping it secret for now, but they are all going to focus on a year, a city, and some sort of dark aspect to it. But I guess I can tell you that the next couple at least will be in the past. If the series keeps doing well, we may look at some futuristic or legendary ones. Lots of places we could go with it, but the next one will be in the past somewhere. Are you going to try and keep catering to larger audiences? Travis: Yeah, each game will accommodate at least 4-9 players. We were surprised how many people latched on to the 2 player aspect of Tortuga 1667. We opened that up mid campaign and people really like that. Ideally our next game will be 2-9, but we are only guaranteeing 4-9 at this point. At any point in time, did you ever consider going through more traditional routes to publish your game? Travis: Not really. I've always been a business minded guy. Kickstarter was always on my mind as Salem was being developed. I honestly didn't know much about the board game industry when we launched Salem. So, I didn't really know those options existed. It's always been in house, and I'm glad we did that. So much of the game is beyond just the game play and handing rules over to another company. I mean so much of it is the design fitting in with the game play and fitting the original vision of the game that I don't think either game would have done as well if we had handed them off. They would have been a little more streamlined and they wouldn't have been given as much love and care as we've been able to give it. We actually had an offer from a pretty big company to buy Salem, we thought about that a few months ago but ultimately declined it. Kind of in the hopes that we can keep building our line of products and grow to be bigger, I think that is going to turn out to be the right decision with Tortuga. Its actually spiked the sales of Salem already these last few weeks. I think part of it is the series aspect, people will keep buying our other games. We're considering relaunching Salem's second edition as part of the Dark City series. Yeah. Those events obviously have a historical place so I could definitely see you guys doing that. Designers always hope that a Kickstarter campaign isn't the end. What is next for you guys after the campaign ends? Travis: Yeah for this game it is a lot of work. We've got surveys, we collect all the addresses, make sure all their add ons are right, a lot of logistical stuff. Right away we are ready to work with our manufacturers, they're ready to go. So we will get them their payment to get things manufactured. That's a couple month process. Making sure all the design files are perfect and getting samples back, making sure it is all right. And then we freight the games from china to our fulfillment centers in the US the UK and Hong Kong. Then we send out the games to our backers. After that we get the game up on our website, and amazon, and work with distributors to get it in stores. Last time I looked, you guys were approaching 10,000 backers. That seems like a big distribution challenge. You mentioned having several fulfillment centers all over the world. How do you mange that? Do the printers help set that up, or did you have to figure it out on your own? Travis: A lot of it is us looking for solutions. The board game industry has always been so helpful to us in pointing us in a good direction for good companies to work with. I've always been really impressed with how helpful competitors are in giving you a leg up. I think the cool thing about the board game industry is if someone plays your game they are almost more likely to play someone else's game because they get into games and find they have a love for them. It's not like a toothbrush. If you find a good toothbrush, you aren't going to buy a competitors toothbrush because you already have one. Whereas with games it's not like "I have a game I can't buy any more." It's quite the opposite, it more like "I have a game I need more games." It lends itself to people being really helpful and pointing you in good directions in terms of all those nasty logistical things like freight and shipping and fulfillment. So we've been pointed in some good directions. When you are designing a game, how different is what we see on Kickstarter from what your original idea was when you started? Travis: Let me pull out some of the old cards. I've got my box of dead games and old versions right here. The original event cards are covered with clipart. There are tons of things that have changed since when we first started. Originally there were dice involved in this game and it focused around avoiding drawing the black spot card. It was actually originally going to be called the black spot, but eventually that changed. Originally there were three ships. There was a ghost ship where dead players would go to play on. We might actually use pieces of that for an expansion. Every single card has changed at some point. All the event cards have been scratched out with a lot of scribbling on the cards. We have a weekly play test night where a bunch of friends come over and just play the game over and over to give us lots of feedback. That's critical to our process. Beyond that we try and get the game into new groups hands all the time. Test, test, test and every time you hate it until eventually it's what you want and you arrive. There is definitely an arrival moment when you realize like "okay, this is it." Like once you've gone though ten play tests and haven't changed anything, then you start to realize you've gotten all the kinks out. It's really fun, I love it. It's a fun process. It was because of the success of Salem that you were able to move into game design full time. Is that correct? Travis: So right when Salem finished its Kickstarter I left my main job to focus on the game. I also had a couple of side ventures to keep paying the bills. I ran a digital marketing company and a few other little things. I was doing games about 50 percent of the time at that point. Now with Tortuga doing well, I've put all my other things aside and I'm just doing games full time. It's really fun, a fun place to arrive at. With these successes can we expect to see Facade Games grow and hire new designers, or do you plan to keep the tight knit group you have now? Travis: I don't know. I like that we are small right now. With fewer mouths to feed there is a lot less pressure to pump out games quickly. Being forced to get games out quickly so you can take care of everyone and maintain size can lead to pushing out games that aren't great. I think an example being some of the bigger companies. They push out a ton of games, but a lot of them are garbage. I don't know, I like that we are small. If we just push out a game a year and slowly build that way, I think that is our focus now. But who knows I'm open to opportunities and if demand for our games keeps growing at this pace then we might need to bring on some more people. For all of those independent designers that are where you were a few years ago, what is the one piece of advice you would give? Travis: The thing I always tell them is to get some thick skin and be ready to take criticism and just print your game and play it. Accept that it will be awful the first 30 times you play it, but you have to get it out there and test it. I think doing that and testing it constantly to improve it is the key to a great game. Too many people work on a great game with just themselves or a couple of friends and they try to make it perfect before they really start testing with strangers. Usually out of fear or not being ready to show people. I'd say just get it out there. You will learn so much through every play through. That's the best way to get a good game going. There are lots of steps to game making. Once the rules are perfect you have to do the art and logistics and set up Kickstarter and all that. The first step is making a great game, so focus on one thing at a time. Once you're ready for the next step there are lots of people that can help you along the way in the board game community. So just focus on making a great game first. Game design is a challenging but rewarding process. Great games aren't built over night. Stay with us as we bring you interviews from other independent designers and creative entrepreneurs. Keep up with us on Twitter, Facebook, or by signing up for our newsletter.